"At five and twenty, Elinor Mompellion had the fragile beauty of a child. She was all pale and pearly, her hair a fine, fair nimbus around skin so sheer that you could see the veins pulsing at her temples. Even her eyes were pale, a white-washed blue like a winter sky. When I'd first met her, she reminded me of the blow-ball of a dandelion, so insubstantial that a breath might carry her away. But that was before I knew her. The frail body was paired with a sinewy mind, capable of violent enthusiasms and possessed of a driving energy to make and do. Sometimes, it seemed as if the wrong soul had been placed inside that slight body, for she pushed herself to her limits and beyond, and was often ill as a result. There was something in her that could not, or would not, see the distinctions that the world wished to make between weak and strong, between men and women, laborer and lord." 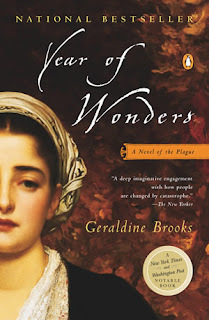 Although the devastation of the plague, a deadly disease transmitted by infected fleas and rodents, was widespread and horrific, it's presence forced many to live more intensely and honestly, including the heroine of this story, Anna Frith, which may be the reason why I'm reading Year of Wonders so avidly. I wonder if Dr. Seuss was referring to one of the benefits of drinking tea? There's nothing quite like a pot of tea to set your thoughts in order, to help discover new ways of thinking about things and solutions to troubling matters. In The No.1 Ladies' Detective Agency series of books, tea helps the detectives and other Batswana think things through and come up with the best solutions to perplexing cases and problems; perhaps that is why they partake in this tradition so frequently, "to think better thinks". "Two days passed--two days in which more rain fell, great cloudbursts of rain, drenching the length and breadth of Botswana. People held their breath in gratitude, hardly daring to speak of the deluge lest it should suddenly stop and the dryness return. The rivers, for long months little more than dusty beds of rust-colored sand, appeared again, filled to overflowing in some cases, twisting snakes of mud-brown water moving across the plains. . . . The bush, a dessicated brown before the storms, turned green overnight, as the shoots of dormant plants thrust their way through the soil. Flowers followed, tiny yellow flowers, spreading like a dusting of gold across the land. Ground vines sent out tendrils, melons would grow in abundance later on, as an offering, an expiation for the barrenness of the dry months that had gone before." The tea cup is half-full. Botswana Day is celebrated on September 30th, the day that this nation, which has achieved great economic growth within the past forty years, became independent from the British. I never regret time spent in Botswana, in the serene world of Mma Ramotswe, a place of hope and good values, even as this African nation copes with modernization. 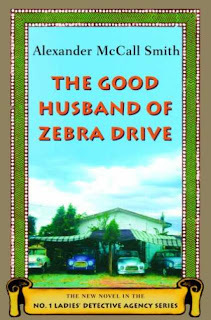 In the eighth book of The No.1 Ladies' Detective Agency series, The Good Husband of Zebra Drive by Alexander McCall Smith, the agency investigates an errant husband, three mysterious deaths at the Mochudi hospital, as well as a case of suspected employee theft at a printing company. Three main characters, Mr. J.L.B. Matekoni, Mma Makutsi, and the older apprentice, Charlie, become restless and yearn for "greener pastures"; each seeks work outside of their chosen professions. Of course, the head detective remains calm and thoughtful, and while the others are like characters in the Wizard of Oz, seeking their fortunes on new paths, Mma Ramotswe grants them this freedom to explore--like a good mother. Will they return "home" ("there's no place like home"), which in this case is The No. 1 Ladies' Detective Agency in Gaborone, Botswana? I'll not reveal what happens here! I read this book quickly, enjoyed it thoroughly, and even started the last book in the series, The Miracle at Speedy Motors last night. I'll be sad when I'm finished with the series, but know that I can always reread these beautiful books. I'm also trying to get the series on DVD; if anyone knows how I can do that please contact me. After I finish reading the ninth book, I may have a party to watch the show with friends and family, where I'll serve red tea and cake, and perhaps some African appetizers. 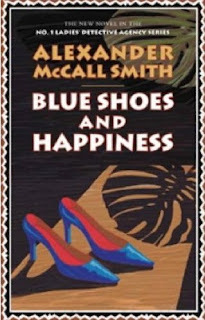 I've been reading this book quickly, eager to learn the significance of the title, Blue Shoes and Happiness. In chapter thirteen, the mystery is over. PLEASE STOP READING NOW if you want to be surprised by what happens; read an older post, navigate away from this site, shut down your computer, get back to work, grab a snack--do whatever you must to stay uninformed. "They are a bit small for me, Mma," she confessed. "I think you were right. But I felt great happiness when I wore them, and I shall always remember that. They are such beautiful shoes." Mma Ramotswe laughed. "Well, that's the important thing, isn't it, Mma? To feel happiness, and then to remember it." "I think that you're right," said Mma Makutsi. Happiness was an elusive thing. It had something to do with having beautiful shoes, sometimes, but it was about so much else. About a country. About a people. About having friends like this. "It is a fine morning again," he said, as he walked up to her. She turned to him and smiled. "I am always happiest in the early morning," she said. "Standing here in the garden watching the plants wake up. It is very good." Mr. J.L.B. Matekoni agreed. He found it difficult to get out of bed as early as she did, but he knew that the first few hours of light was the best part of the day, a time of freshness and optimism. This passage from In the Company of Cheerful Ladies by Alexander McCall Smith captures the sense of optimism experienced by Mma Ramotswe and Mr. J.L.B. Matekoni in the early morning, before the intense heat and worries of the day set in. In the mornings, the tea cup is half-full; each new day holds promise and possibility, as well as peace and excitement for what's ahead. As the hours of the morning pass, we move into different states of mind. If the lesson of the morning would last for the day, then we'd effortlessly stay optimistic and positive throughout the day! 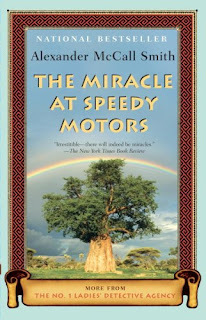 The New York Times Book Review called this book, "A literary confection of . . .gossamer deliciousness. . . ." I've just started reading another very enjoyable tale set in Botswana, In the Company of Cheerful Ladies by Alexander McCall Smith. Super sleuth Mma Ramotswe has a mystery in her own life right now--who left the delectable pumpkin on her porch? (That shouldn't spoil too much of the story for you should you decide to read it!) As with all the books in this series, the beginning chapter summarizes events from the previous books, so readers don't need to read each one to know what's going on, although I've made the choice to read each book of the series, in order. Last night I had to pick up a few groceries and found a container of rooibos, the ever-present tea in the No.1 Ladies' Detective Agency series, to enjoy at home. I was tempted to buy a red tea with the enticing name of "Botswana Blossom", but decided to get the plain red tea instead, as I'm a bit of a purist. Red tea is an indigenous herb of South Africa called rooibos (ROY-boss). It's supposed to be very healthy, loaded with polyphenols and flavonoids which help protect against the onset of aging and disease. Red tea apparently has all the benefits of green tea, without the caffeine. I'm thrilled to report that I've been getting more international traffic to Suko's Notebook--from at least 16 countries--including numerous guests from Gaborone, Botswana, the setting for The No.1 Ladies' Detective Agency books! Of course, I also greatly appreciate my visitors from the United States. As always, I welcome your comments, and pertinent questions may be emailed to me--I usually respond within 24 hours. One remarkable thing about the internet is that it brings people from all over the world closer together. 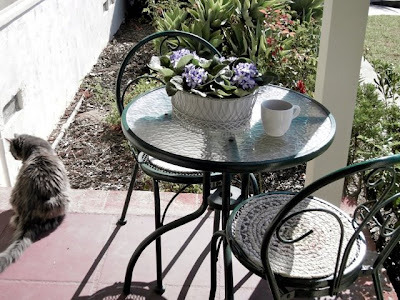 As we conduct searches and research from our homes, offices, libraries, and schools--or anywhere else with an internet connection--we connect with people world-wide and learn about other cultures--and seem a bit closer to peace on earth. On this seventh anniversary of the horrific events of Sept. 11th, please take at least a few moments to remember the victims, as well as the many heroes of that day. 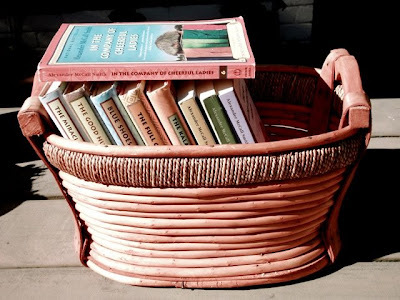 As you can see, I've found an ideal basket for The No.1 Ladies' Detective Agency Series of books. Having finished reading The Full Cupboard of Life today, I 'll soon start In The Company of Cheerful Ladies (perched on top of the other books). "You must write that book, Mma,"urged Mma Ramotswe. "I would read it, even if I was not planning to run an orphan farm." "Thank you,' said Mma Potokwane. "Maybe I shall do that one day. But at the moment I am so busy looking after all these orphans and making tea and baking fruit cake and all those things. There seems very little time for writing books." "That is a pity," said Mma Makutsi. These ladies echo the sentiments of Virginia Woolf. 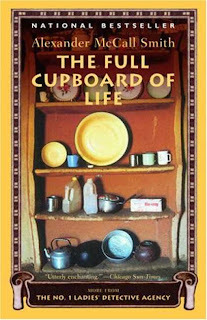 Mma Potokwane has become a more central character by the fifth book in the series, The Full Cupboard of Life. Like Mr J.L.B. Matekoni, we know that when Mma Potokwane serves him special cakes, as she frequently does, he should be on his guard because she'll inevitably ask a big "favor" of him. It's difficult--if not impossible--for this very kind man to turn this very strong woman down, and her requests are often quite large. 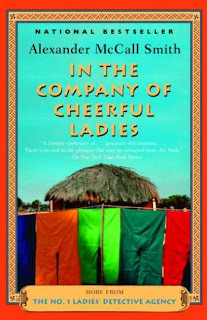 I'm looking forward to reading the sixth book in this series by Alexander McCall Smith, and expect to soon find myself in the company of cheerful ladies. "Tea of course, made the problem seem smaller, as it always does, and by the time they reached the bottoms of their cups, and Mma Makutsi had reached for the slightly chipped tea-pot to pour a refill, it had become clear what they would have to do." "So I see,"said Mma Ramotswe. "And I see, too, that they have just made tea". "It is better for them to drink tea than strong liquor," intoned Mr Bobolgo, looking disapprovingly at one of the girls, who cast her eyes downwards, in shame. "Those are my view, too," said Mma Ramotswe. "Tea refreshes. It clears the mind. Tea is good at any time of the day, but specially at mid-day, when it is so hot.' She paused, and then added, 'As it is today." "You are right, Mma," said Mr Bobologo. "I am a great drinker of tea. I cannot understand why anybody would want to drink anything else when there is tea to be had. I have never been able to understand that." Unfortunately, Mr Bobologo doesn't get the message, and Mma Ramotswe must go without the coveted cup of tea. "Most people had something in their lives that was particularly important to them, and she supposed that the Botswana Secretarial college was as good a cause as any. What was it in her own case, she wondered? Tea?" Tea comes to her mind (though she wishes she could think of something else). In these books, tea is nearly as important as any other character, and chapter eight is even titled, "Tea is Always the Solution". I often find myself craving a cup of tea as I read them. "There was a country so large that the land seemed to have no limits; there was a sky so wide and so free that the spirit could rise and soar and not feel in the least constrained; and there were the people, the quiet, patient people, who had survived in this land, and who loved it. Their tenacity was rewarded, because underneath the land there were diamonds, and the cattle prospered, and brick by brick the people built a country of which anybody could be proud. 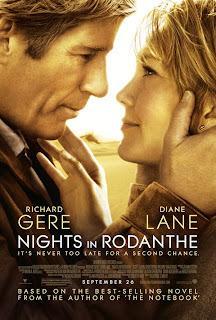 That was what Botswana had, and that's why it was a fortunate country." Mma Ramotswe's pride in her country is palpable and contagious; I picture the incredible expansiveness of both land and sky. I've included a map and flag of Botswana from (wonderful) Wikipedia; stunning photos of Botswana can be found on Technorati. "At the end of each term, those who had done well would receive a prize for their efforts; an atlas perhaps, or a Setswana Bible, or some other book which would be useful at school. Although she was not a great reader, Mma Potokwane was a firm believer in the power of books. The more books Botswana had, in her view, the better. It would be on books that the future would be based; books and the people who knew how to use them." Fiction aside, there's a real problem with orphans in Africa, because of diseases, famine, and other problems, which leave children without parents to raise them. Mma Potokwane thinks that if she were to write a book, it would be an instructional manual on how to run an orphan farm, with practical advice about management, fund-raising, and child psychology. She's not sure that she's up to the task of writing a book, but if she did, she'd express "the old Botswana morality" by writing something that would help others. 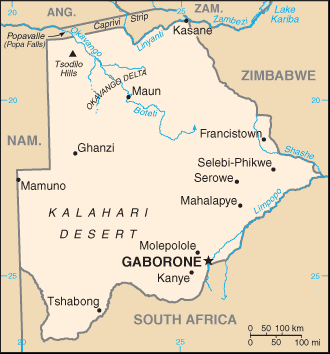 Interestingly, I had a reader from Gaborone, Botswana--the setting for The No. 1 Ladies' Detective Agency books--visit this blog a few days ago. This person was researching the importance of books! The Botswana Book Project, established in 1998 by Pam Shelton, is helping to build libraries in beautiful Botswana.